The Hidersine HEV Electric violin outfits. The HEV2 electric violin by Hidersine is an excellent option for students who wish to practise in silence, using headphones. No more annoying the neighbours, siblings or scaring the cat! However, when plugged into an amplifier, the possibilities are endless. Not only will your electric violin sound like a regular acoustic instrument, but you could plug into your tablet or PC to record, or use third-party software to add countless effects. Hidersine’s HEV2 delivers a fantastic tone when amplified or when using headphones, as it will sound just like a regular violin. However, the fun doesn’t stop there. You want to practise without anyone else hearing? No problem, just pop on a pair of headphones or earbuds and play to your hearts content with almost no audible acoustic tone. Want to play loud and proud? Then plug the violin into an amplifier and crank it up. Want to experiment with your sound? Then use some guitar effects pedals or an app on your phone to add effects to your violin playing for awesome results. 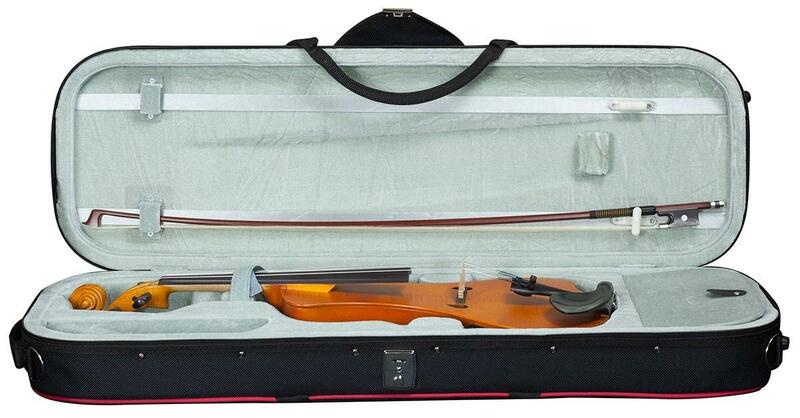 Suitable for all levels of musician: Although a fantastically useful tool for a violin student, the Hidersine HEV2 is not solely for use in this context. As the violin is built to high standards, observing the traditional scale and construction of acoustic violins, any player of any standard can pick it up and play immediately. Proficient players can choose this instrument as a backup or additional tool in their musical arsenal, choosing to use the HEV2 as an experimentation tool. Perhaps you fancy busking, but don’t fancy taking your vintage violin out on the streets. Just grab a small amp and your HEV2 and you’re all set. 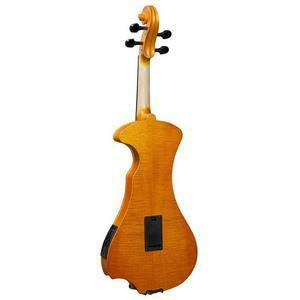 Although the Hidersine HEV2 is a modern-looking violin, it is built to the same exacting standards as an acoustic instrument of the same level. 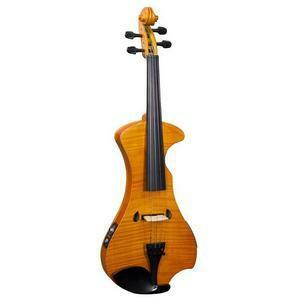 The body is made of birch, which helps produce a good resonant tone when amplified. 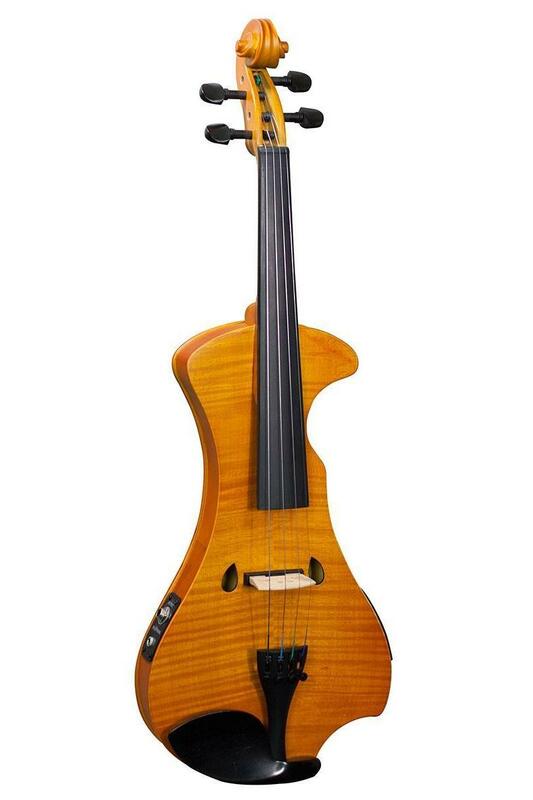 The birch body however has a veneer of flamed maple on the top and back which echoes the look of the hollow maple bodies of acoustic violins. The pegs, fingerboard and chinrest are made of genuine ebony. The use of ebony has long been a mark of a quality violin, as ebony is an excellent hardwood which can withstand the strain of high tension strings for a very long time. Therefore, not only with the fittings look and feel authentically traditional, they will last a lifetime of wear – unlike those instruments that use inferior wood, painted black to look like ebony. 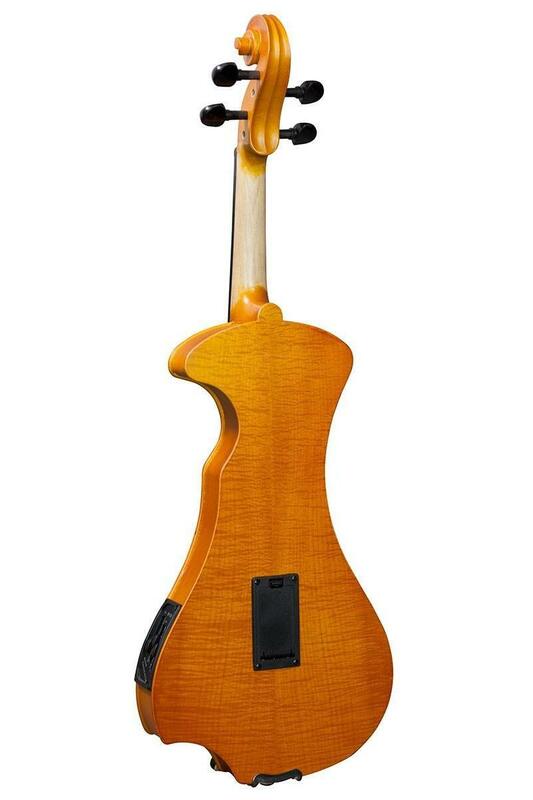 Using a ‘Piezo’ pickup located under the maple bridge of the violin, the Hidersine Electric Violin will reliably capture every nuanced detail of your playing style, whether audible externally through an amplifier or played discreetly through headphones. On one side of the instrument are the outputs – a 6.35mm large jack output for use with most instrument amps, and a 3.5mm mini-jack for use with headphones. On the other side is a preamp, where volume is controlled along with bass and treble EQ controls. The battery compartment for the preamp is located in the back of the instrument.